Emergency and survival situations are by their very nature unpredictable, we can safely assume that they will occur, especially in areas prone to severe weather events such as hurricanes and tornadoes or to flooding. If you live in any of these areas and are not making some sort of preparation for those emergencies you are being foolhardy but the ‘survival kit’ you need for these sorts of emergencies are very different from the kind you might need to supplement basic outdoor kit while hiking or canoeing or the kind of survival kit you would want to carry in your car on long journeys or in bad weather. 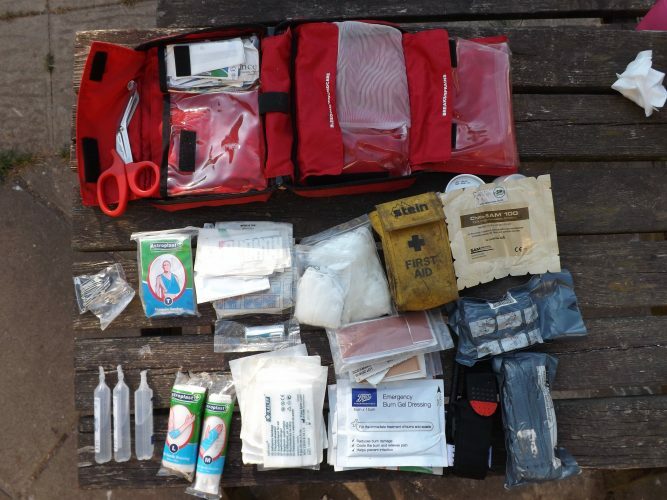 In this article we will be looking at ‘one stop shop’ survival kits, kits that can be purchased as complete kits rather than what to include in them if you are putting a survival kit together from scratch. I did mention what I would put in a survival kit in a previous article on Bug Out Bags so you can check that out here if you are interested. Shop bought survival kits can be separated into a few different categories and we’ll deal with those categories separately to avoid unfair comparisons between kits with different functions. The three categories we will deal with are first aid, miniature kits and kits for home and vehicles. Any first aid kit is better than none but if you are making preparation for emergencies you should be aware of what kit you need to save a life and what kit is just for minor cuts and scrapes. This is a very basic first aid kit which includes a separate pocket first aid kit, this extra pocket sized kit is a great idea, I always carry a simple case of band aids in my pocket for small cuts but even my most basic first aid kit contains some proper trauma dressings whereas this first aid kit doesn’t. It is the kind of kit that you might keep in a kitchen drawer at home in case of cuts and scrapes but you will need to make further preparations for treating potential traumatic injuries, this simple kit just won’t be sufficient to treat severe wounds. 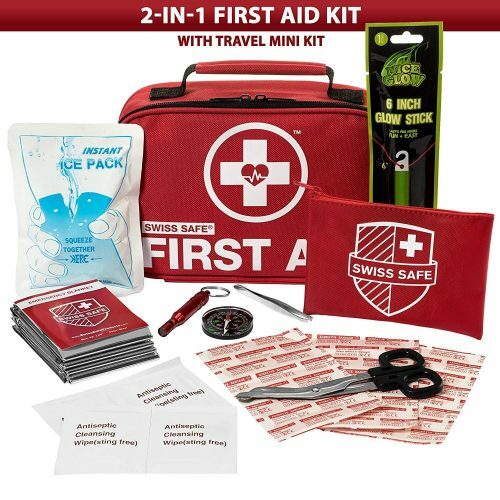 Also be aware that although this kit being ‘FDA approved’ might sound reassuring it is only approved at a certain level and doesn’t mean that it is suitable for treating everything, a first aid kit can be FDA approved without it being suitable for treating life threatening traumatic injuries and catastrophic bleeding. WAT-T Tourniquet- REAL- A must have for any first aid kit, can be used as a tourniquet, a pressure dressing, or an elastic bandage. The SWAT-T is a great tourniquet. Fast and easy to deploy and very versatile. This Tourniquet is new and growing in popularity. Out of all the other tourniquets on the market this one will cause the least amount of damage to whom it is applied. SWAT-T was the best tourniquet option especially if you have to apply this to a smaller child or and elderly person. 6″ Israeli Battle Dressing- REAL- Authentic Israeli Pressure Dressing, This is a lifesaving bandage, military personnel around the world carry one of these in a personal first aid kit or gunshot wound kit. The Israeli bandage is the best trauma bandage on the market today. Simple yet effective. This is the standard everyone tries to copy. We chose to stick with the original. The simple reason that comparatively few first aid kits contain proper tourniquet, and you may have to add your own, s is that for years they were taboo. Even fairly advanced first aid training either didn’t teach how to use tourniquets or actively told people not to use them. This meant that so few people were trained to use them that first aid kit manufacturers just didn’t include them. More recent advances in emergency medical care by the armed forces though has brought things like the CAT tourniquet to the fore and demonstrated their effectiveness and they are now standard pieces of equipment for military and civilian emergency care. If you combine the two kits reviewed here you will have everything you need to treat minor wounds and deal with a single major bleed. 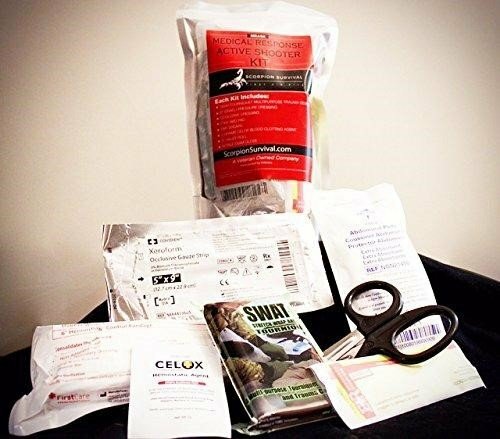 Consider stocking up on several individual trauma kits like the one here and keeping one in your bug out bag, one at home and one in your car, also consider the need to have spares in case you have to deal with multiple casualties, a first aid kit specifically put together for gunshot wounds is a good choice for dealing with traumatic injuries as it will contain the tourniquets, haemostatic dressings, large trauma dressings and often even chest deals for dealing with sucking chest wounds. Something like this Lighting X Trauma and Bleeding Kit would be idea, but again you may need spares if you want to be prepared for multiple casualties. 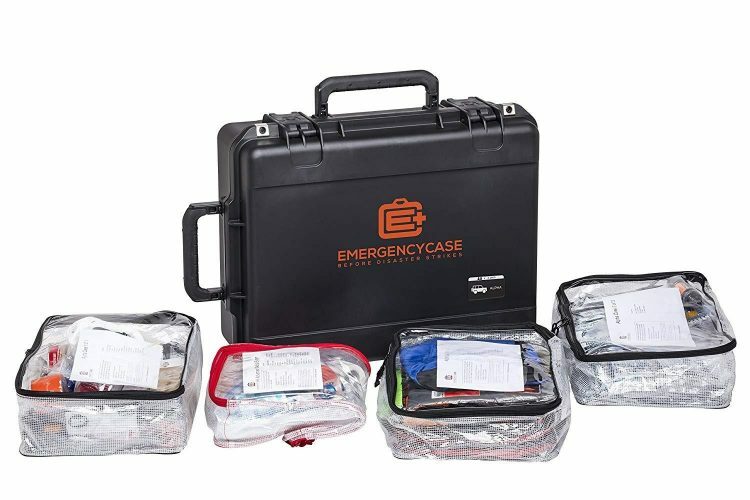 A full comprehensive trauma kit like those used by EMT’s and first responders would be the next step and would equip you with just about everything you need for even advanced emergency care. However do remember that if you start to include things like airways and equipment to deliver oxygen therapy you should get some training in the use of that equipment to ensure you provide the best care possible in an emergency. Figure 2; My own trauma kit that comes with me whenever I go shooting or hunting or am using an axe or chainsaw. The concept of a miniature survival kit is an old one, look in just about any survival manual and you will see suggestions for lists of kit you can cram into a small tin to carry with you. These miniature survival kits could be carried as a supplement to your regular outdoor kit on a hiking or camping expedition in case of emergencies, or carried as an edc item in case of disasters or carried by military personal to aid in escape and evasion scenarios. This compact miniature survival kit has an excellent array of tools and equipment which would be useful in an emergency situation. The small knife, flint striker, compass, cord and fishing kit take care of most of the essential survival needs. Conspicuous by their absence is anything to provide shelter or purify water. If the container it comes in was made of metal the absence of any water purification tablets wouldn’t be as significant as you could use the container to boil small quantities of water on your fire. A small space blanket could have been included to provide some shelter but would have made the kit slightly larger. 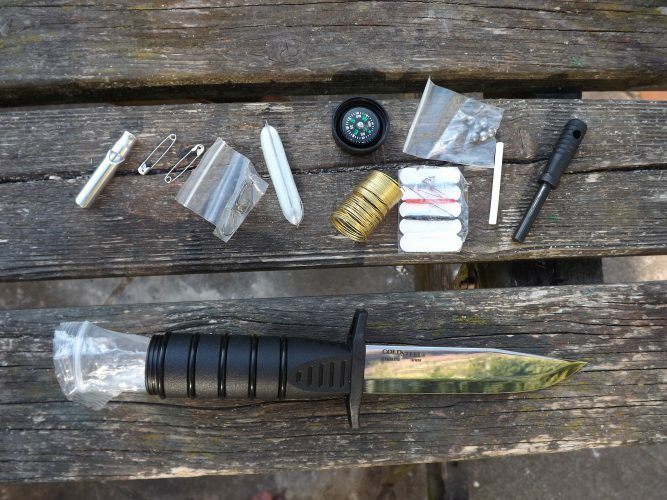 The small size of this kit does make it easy to include amongst your edc items but do remember that as it includes a knife you couldn’t carry it in your hand luggage on an aircraft in case of that hypothetical plane crash that every survivalist imagines might occur. 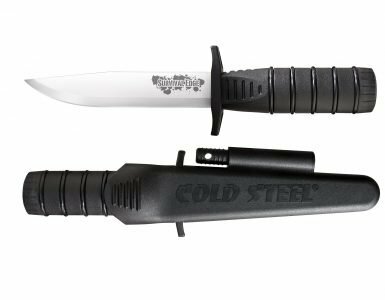 I can highly recommend the Survival Edge by Cold Steel, it is very strong and the only complaint I have is that the chunky cylindrical handle isn’t all that comfortable. Most knives in this style though are very poorly made and cheaply constructed and will often break at the junction between blade and handle. 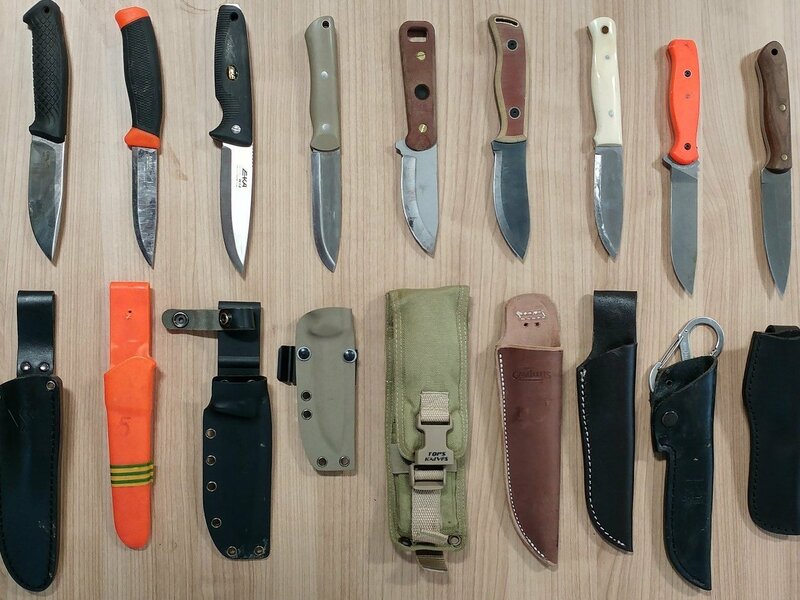 The knife style was popularised by the Rambo movies and if you can find a good one you automatically have a useable knife rather than a potentially weak, small knife that has to small enough to fit into a tiny container. GearPods Survival Pro helps you confront on-the-trail situations and emergencies with confidence, providing all of the convenience and versatility of the survival tools found in the GearPods Survival kit, plus the GearPods Stove System (minus the Burner). This self-contained system combines the GearPods CookMug and the emergency-use GearPods Stove that burns solid fuel tablets. Two fuel tablets are provided. All of the survival tools are packed neatly inside the GearPods Stove/GearPods CookMug within a durable, lightweight and watertight XL GearPods container that you can easily throw into a backpack or even a jacket pocket. Imagine the combination of a complete set of survival tools and an integrated cooking system being so easy to carry and pack. Start with the GearPods Adventure Tarp, an ultralight one-person ripstop nylon tarp that weighs an amazing 1.47 ounces per square yard. The Adventure Tarp is double coated with silicon for maximum water protection and features 9 fabric tie loops including a reinforced center loop. Use these loops with the 25 feet of nylon cord (1.4mm, 70lb breaking strength) and the set of six (6) 1-2mm Line-Lok Line Tensioners provided to construct any number of different shelter configurations. As added protection against the elements, GearPods Shelter kit also includes a hypothermia/thermal blanket that reflects back up to 80% of your body heat. GearPods Shelter is packed into a durable, lightweight and watertight Large GearPods container and includes printed instructions. 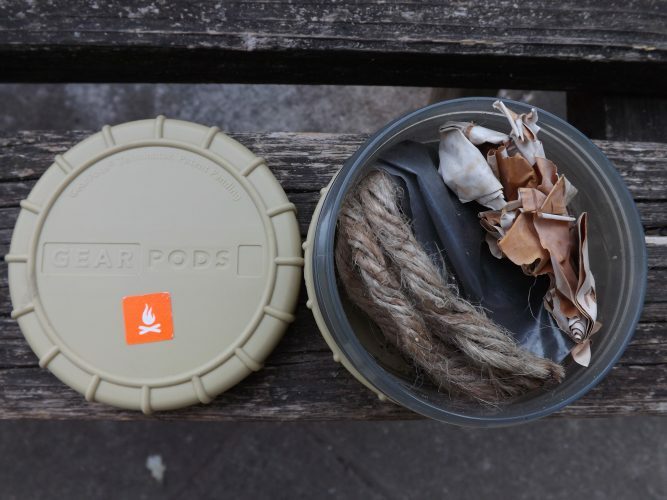 I’ve been really impressed by GearPods, the containers themselves are strong and versatile and I use them among my own gear for carrying fire lighting material, small food items like seasonings and hot drink sachets, water purification kit, fishing hooks and weights and a range of other things. They are strong and can be stacked up. Each one comes with a set of stickers to mark them up and indicate what you have in each container. Figure 4; The small GearPods container I use for fire lighting and tinder. 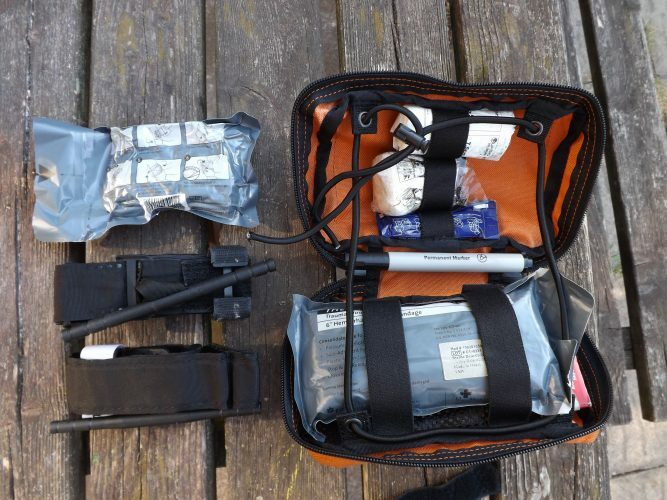 The kit that comes in the GearPod Wilderness kit is well thought out and of good quality. Many shop bought survival kits are stocked with cheaply made low quality survival gimmicks, gear pods is not one of these kits it is packed with high quality functional items which will be useful in a true survival situation or as part of your general wilderness living strategy. 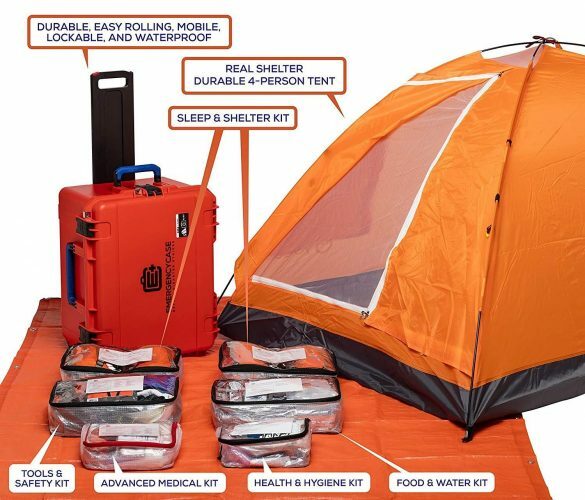 The fact that the Wilderness kit contains a full size tarp for shelter, cooking stove and container puts it head and shoulders above many other small survival kits. Figure 5; this kit contains all the basic tools for survival including a mylar blanket for shelter and warmth. While this kit does have all the basic tools, you can see just by reading the contents and specification from the sellers that it is not necessarily put together by experts. For example the contents lists a ‘flint stone’ despite the fact that there is no flint in the kit what it’s referring to is a ferrocerium rod. 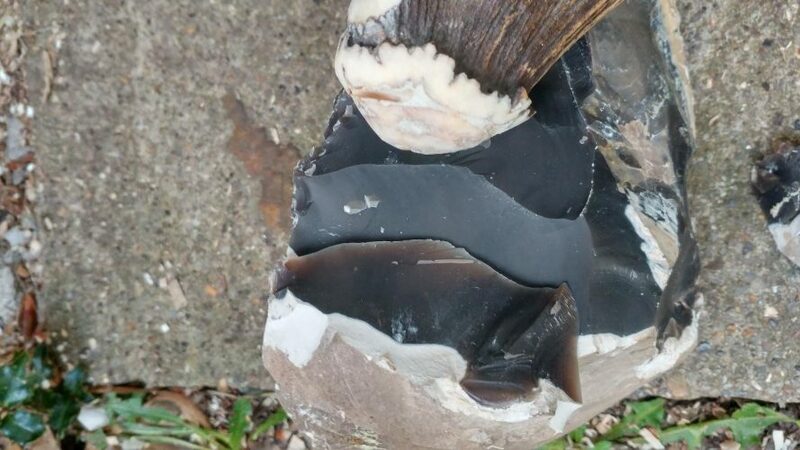 Figure 6; flint was traditionally used to strike spars from iron pyrites and also used to knap blades, arrow heads and other tools. Some of the components of this kit are a bit of a gimmick but the fire steel, mylar blanket and whistle are particularly good items. A whistle is something I would even recommend is carried on a daily basis as one of your edc items, it makes signalling for rescue in case of emergencies much easier. The flashlight the kit includes is another useful item for signalling or just for the obvious seeing in the dark. Although the kit includes plenty of useful tools it doesn’t contain any of the consumable items that you need in a survival kit, no fishing hooks, weights, fishing line or wire for snares leaving you without the means to get food from the wild unless you improvise it yourself. You could turn a few safety pins from your first aid kit into fish hooks and improvise line from the inside of your shoe laces or from natural fibres. The Readyman wilderness survival card was designed designed and produced by a community of United States Special Forces operators, who have included the essentials needed to survive on your own in the wild or during an emergency. 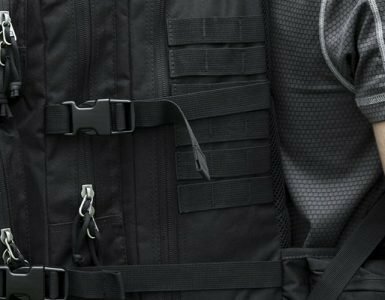 The contents of the kit includes a whole range of small items that often aren’t included in larger survival kits, they can easily be detached from the card and used in conjunction with other basic pieces of edc kit. A detailed review will follow. This bracelet is one of several items included in the Everlit Emergency Survival Kit but because the kit it ‘self is fairly similar to some of the others featured in this article I’m going to focus on this particular part of it. Paracord bracelets have become very popular as fashion statements as well as for their potential as a survival tool. 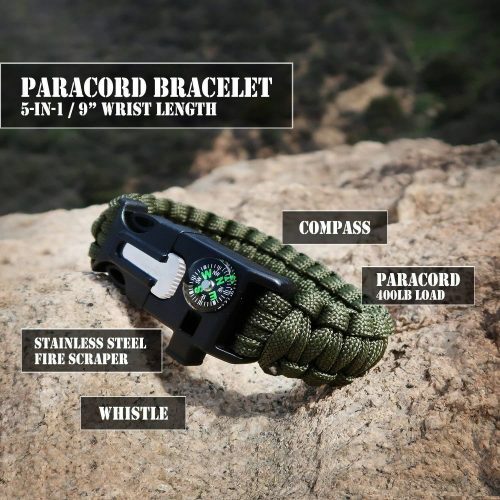 Being able to store a useful length of paracord and carry it on you at all times as a bracelet is very expedient and having other survival tools integrated into the bracelet makes it even more valuable. thermal blanket(gold colour for the maximum reflection in a snowfield). 5 FEET of paracord which can hold up to 400lb. 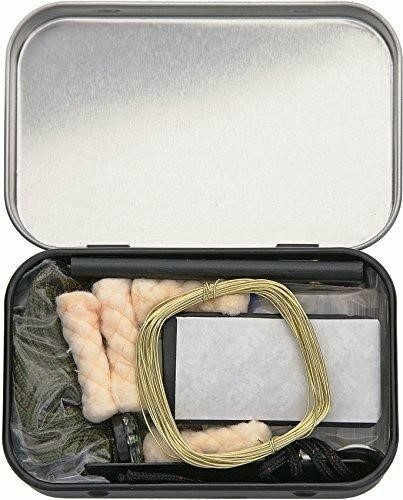 This particular kit combines many of the useful features of some of the previous ones including a small first aid kit, basic tools and adds the paracord bracelet too. 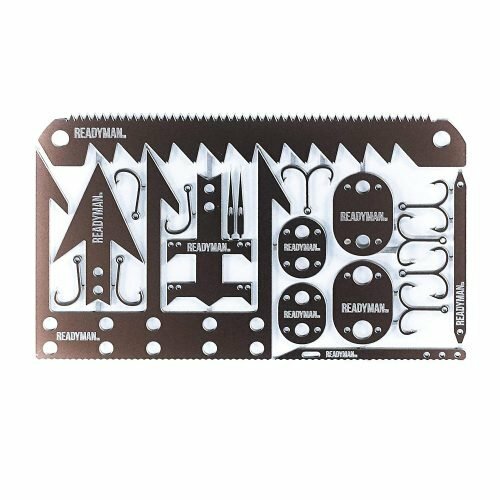 Fish hooks and other food items for getting food in a wilderness survival situation have been overlooked again but as the Readyman card is so small and light it would be very easy to carry one of these as well as this whole kit. Designed by Randall’s Adventure & Training, the Izula Gear Mini-Kit is a pocket-size survival kit tin that is perfect for keeping your essential items safe and undamaged. The ESEE mini survival kit is the perfect size to include amongst your edc items. 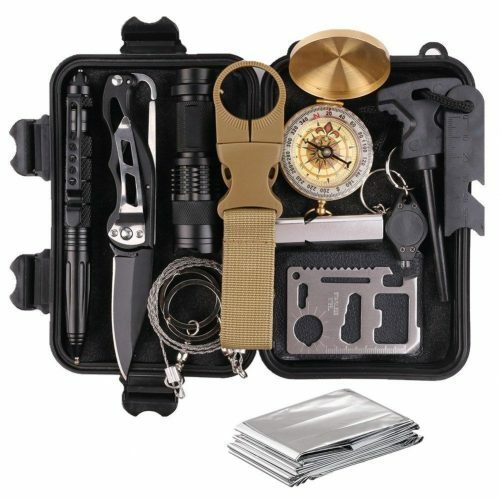 It doesn’t feature quite as many tools as some of the other survival kits presented here but when coupled with an edc knife and a few other pieces of edc kit like a flashlight and small first aid kit this small kit contains all the consumable items required for wilderness survival. Combined with a decent locking edc knife such as the Cold Steel Finn Wolf a pocket flash light such as the Olight H1 and a paracord bracelet and a suitable first aid kit there aren’t many better options than the ESEE kit when it comes to a miniature survival kit. One of the biggest advantages of this kit though is the guaranteed quality of the equipment in it. ESEE and Randall Adventure Training have a fantastic reputation and produce some fantastic knives as well as survival aids. Rather than saving money on some cheaper offerings consider spending you money just once and getting a kit with a bit of pedigree. For longer term survival or ‘bugging in’ at home in case of major emergencies consider a much larger survival kit, a bug out bag could be considered a survival kit but as bug out bags are addressed in detail in this article we will concentrate more on kits for static survival or use in a motor vehicle rather than one for bugging out on foot in an emergency. The 2 person emergency case is described by the manufacturer as meeting and surpassing the the U.S. Governments suggested preparedness guidelines contains US coastguard approved 3-5 yr food and 5 yr water shelf life. This kit is intended for use in a vehicle, although we often think about preparing for emergencies by stock piling things at home or in a bug out bag for escape on foot in reality there is as much chance that disaster will strike while you are traveling in your vehicle. The tools, tow rope and jumper cables will come in useful in the more mundane, but still inconvenient, risks of operating a vehicle such as flat batteries or punctures. They may also be essential for bugging out in your vehicle allowing you to tow abandoned vehicles out of the way which might block the road or dig yourself out of a snow drift. The advanced medical kit is sufficient for traumatic injuries consistent with car accidents but I would recommend the inclusion of a second tourniquet and some celox. These larger kit’s are also the only ones large enough to contain food, and over Winter every year the need for this becomes obvious when people are trapped in their cars and have to be helped at the roadside by the emergency services. 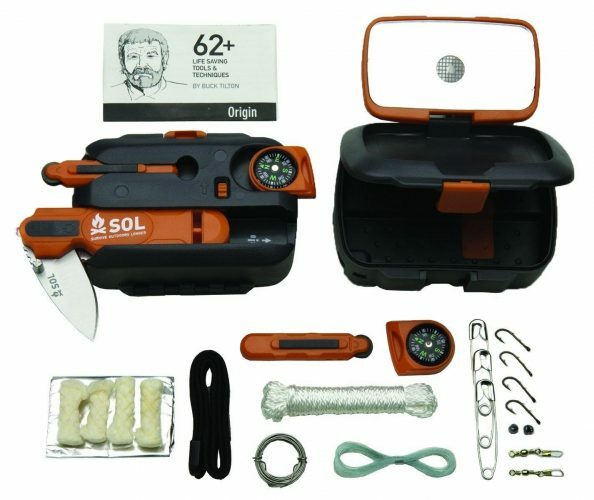 This kit will give you food for several days and will save you from having to resort to foraging and hunting quite so soon. Given that it is quite a large kit I would consider adding a small stove to it for heating water and warming food. 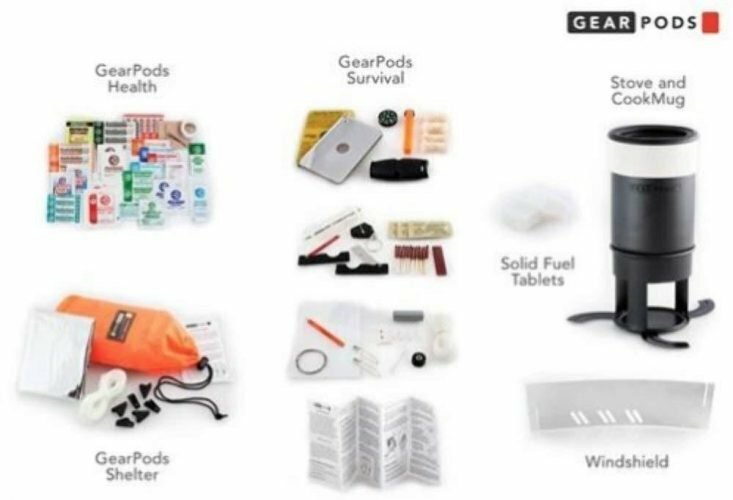 About as comprehensive a survival kit as it’s possible to find, this kit includes everything an average sized family would need in the event of an emergency. Sleeping bags and proper shelter are often overlooked in survival kits as they are often thought of as a last resort they might not always be expected to provide every comfort. However if you are providing for a family in an emergency it is important to consider the comfort of younger children to maintain their morale. The morale issue is also addressed in this kit by the inclusion of a deck of cards and some chalk. As important as maintaining morale is, maintaining good hygiene becomes important in survival situation and emergencies which last more than a couple of days and this kit also includes hygiene kit. Too large to easily transport by hand the kit also includes a small backpack that can be used to carry some of the kit’s contents. All in all a very thorough survival kit for home based emergencies. As we are dealing with kits in different categories picking a single one as a the best out of these ten but I do carry a first aid kit almost identical to the tactical first aid kit, I have a readyman wilderness survival card in my wallet and have got through three of them in two years as I find them so useful and I keep an ESEE mini survival kit in my hunting bag. All those items have served me well and I can highly recommended them to you as items that really can save lives. Geoff has a background in professional game and deer management, he has put his years of experience to good use and now lectures at Hartpury College, one of the UK’s leading providers of land based education. He specialises in training game and wildlife managers who will go on to work in professional game management, conservation and other outdoor professions. He has been teaching at colleges for eight years and in that time has worked at some of the most prestigious land based colleges in Britain. He also writes about bushcraft and survival on his blog Bushcraft Education .